The results of the Municipal Elections in South Africa bears testimony to our dynamic democracy. The 9th of August is celebrated as our National Women’s Day. The 8th of March is celebrated as the International Women’s Day. Can you imagine a world where women in leadership positions reflected the demography of the country? – actual positions of decision-making in the public and private spheres. Can you imagine a world where women are not conflicted between raising her family and having a career? Are we held up to higher standards than men? Are we raising our daughter and sons to be dynamic leaders and citizens equally? When we climb up the ladder, do we enable other women to follow or do we throw away the ladder? As a single mother, I have been fortunate to have supportive bosses. Being a single mother in SA is a common experience, how do we respond to this social norm? What role does business have in creating an enabling environment for working mothers? Women and children experience the greatest brunt of poverty and inequality. STATS SA highlighted that irrespective of household size, female-headed households were more likely than male-headed households to have no employed person in the household. The economic gap must be addressed. Sexual and reproductive health rights has always been a critical priority for women. HIV is on the increase, mainly among young women. I listen to stories about Mavuso stokvel and wonder what is the role of men in women empowerment? Gender transformation is widely nuanced. Society is diverse. We live in exciting times where we are free to express ourselves without fearing discrimination and prejudice. Given our vibrant democracy, what role does society have in embracing individuality and promoting equality? 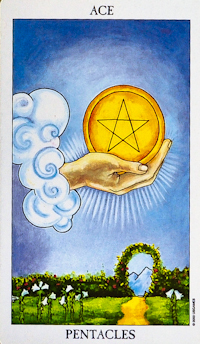 The Ace of Pentacles denotes divine gift of power and practical application in physical matters. It reflects accomplishment in areas of home, business, career or anywhere we need stability. It can also point to a new opportunity for enterprise. Good news about money may be forthcoming. If you’re thinking about changing jobs, this a good sign. For those of you interested in learning tarot, buy yourself a deck and follow along. This is a segment that will teach you the basic tarot card meanings. The tarot deck contains 78 cards. There are 22 Major Arcana, 4 Aces, 36 Pip cards and 16 Court Cards. Please note that Tarot reversals are not covered here. The Tarot system is multi-layered as a visual language of inner experience. The Fool is the first Major Arcana. The Major Arcanas reflect life lessons that are like destiny cards (karma). You will need to embrace the lesson if you want to move forward. Zero symbolises the space before manifesting (the unborn spirit), nothing and everything. No beginning and no end. 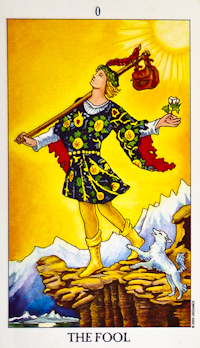 The Fool represents a new beginning, something new, a fresh start, a new direction. It requires blind faith to take a risk. Be open to receive. Change is unchanging. The Fool is free-spirited. The Fool can imply a new journey or a change in attitude that is required. He represents spontaneity, fun, surprise and untapped potential. The Fool does not overthink things. Perhaps, you are starting something new without much knowledge or foresight. It is important to read cards in conjunction with the surrounding cards in a spread. Although, the Fool is depicted as a young man, it applies equally to women. In fact all the tarot cards are not necessarily gender specific, it mainly reflects types of energy. The Fool asks you to be in the present moment. Ask yourself whether you are following your dreams and passions? Please leave comments and share your thoughts. What is your interpretation.